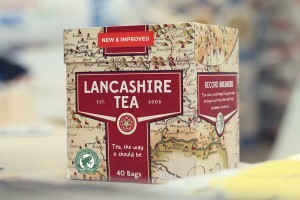 Home › Uncategorized › *OFF TOPIC* Lancashire Tea… should help to keep you warm! On a very off, random topic. Did you even know there was such a thing?! I was so surprised when I was doing my weekly shop to see Lancashire Tea stocked in my local TESCO store. Being a Lancastrian, I did the right thing, and bought a box for myself. Now, I am very fond of a cup of tea, and I’m also very picky so my true opinion of Lancashire Tea really did depend on its taste. The box depicts a map of Lancashire, which I believe dates back to the mid 1500’s, it’s very informative and certainly gives you something to look at whilst the kettle is on. The verdict, very, very impressed. It tastes great, it infuses the water very quickly and doesn’t leave that horrible clacky sensation on the palette which you can get with some others. If you live in Lancashire, I’d strongly recommend you take a look. According to their websites its in all of the major supermarkets. I had the ‘Classic’ blend. If you didn’t manage to get a boiler fitted before winter, this should keep you warm in the mean time. NOTE: According to their twitter and Facebook pages, they have a new and improved version coming out soon!! ‹ Are Boiler Grants still available?